Offering a more subtle action than the original Rage Craw, the new Strike King Rage DB Craw is perfect for colder water temperatures or when bass just aren’t looking for a fast paced action. 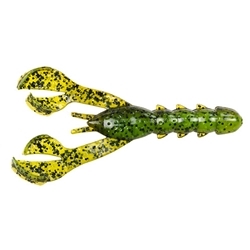 An excellent flip bait, its streamlined design allows it to easily get in and out of cover, and its ribbed body and claws slow its descent to maximize time in the strike zone. Also a great choice on a Carolina-rig, rigged weightless or as a jig trailer, the Strike King Rage DB Craw delivers a lifelike crawfish presentation that bass can’t resist. Available in a range of proven colors, pick up the Strike King Rage DB Craw and see what the Rage is about.